But this emphasis on the life-enriching potentialities of Yoga is not entirely absent in the ancient tradition; it is there in Gita’s Yoga and much more strongly in Tantra Yoga. And also, among modern Yogis, it was Sri Aurobindo, who was the first to give a clear vision of the life-transforming power of Yoga. But at a certain stage in the spiritual history of India, the integral life-affirming spiritual vision of Gita and Tantra was overshadowed by the life-denying illusionist philosophies. As a result most of the traditional spiritual philosophies and Yogis and seekers belonging to these schools tend to give the impression or view of Yoga as a means of escape from or renunciation of life and merging into a life-negating Reality beyond space and time and the world. Satyananda Saraswati’s teachings on Yoga represent a shift or a change in this traditional view of Yoga. Satyananda is a traditionalist, who took to the traditional path of renunciation, sanyasa as it is called in India, at a very young age. But he never preached the path of sanyasa to all. On the contrary, as we have seen, the primary emphasis of his teachings is on the power of Yoga for ennobling and uplifting the quality of life of the common man. In fact he goes to the extent of telling that, “Yoga does not lay down extraordinary conditions of self-discipline and behaviour patterns. You can continue enjoying the good things of life and still be a Yogi; not indeed, is it necessary to give up worldly ambitions and material aspirations to take up to the Yogic life. One need not however be a slave of desire.” This liberal view of Yoga may appear to some of the traditional Yogis as a considerable dilution of the high and austere discipline and aim of Yoga. But Satyananda’s view on Yoga does not go against the traditional spiritual vision of Hinduism which is life-embracing and holistic. This traditional Indian view holds a hierarchy of values before the individual and the collectivity. In this Indian systems of values, material interests, ambitions and desires and the desire for the enjoyment of life are viewed as legitimate needs of the individual. But the pursuit of these physical and vital needs has to be governed and guided by some mental and moral ideals, keeping constantly in the back of the mind the spiritual ideal as the highest aim of life. This holistic vision of life is exemplified in the way of life prescribed for a householder in an ancient tantric text. This tantric text says categorically that a householder who remains lazy and who did not make any effort to earn wealth is a sinner. But the text also says that a householder who didn’t distribute his wealth to help the needy and the poor in the society is also a sinner. Here the material desire for wealth is given a restraining moral impulse. This may not be unique to the Indian view of life but somewhat similar to the protestant ethic of the West. But the unique Indian element in the text is that it imposes on the householder a lofty mental and spiritual discipline. The tantric text says further that the householder should dedicate all his actions to the Eternal and constantly in pursuit of knowledge into the deeper truth of things tatwa gnana. Similarly, Madhavacharya a well-known spiritual teacher of ancient India said to his householder disciples, “Do your duty honestly. Enjoy whatever fruits that comes to you as a result of the honest performance of your duties. But dedicate all your work, the result and the enjoyment to God”. Thus, in this way, if the hierarchy of material, moral and spiritual values can be lived consciously and simultaneously – with an emphasis on specific aims at each stage of evolution – then that is Yoga. So Satyananda Saraswati’s vision of Yoga is, in a way, rediscovery of the ancient holistic spiritual vision of life. Sir, It is really great on your part that you mentioned Swami Satyananda. In fact he is regarded as the latest authority on Tantra Yoga. 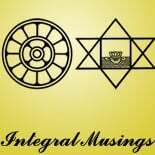 This entry was posted on September 9, 2014 by integralmusings in Religion, Spirituality & Philosophy.